When parents send a check in the mail or donate online to their favorite charity, it usually doesn’t occur to them to share their act of charitable giving with their children. This author, who started writing this book when she was only fourteen, puts the power of giving directly into kids’ hands. 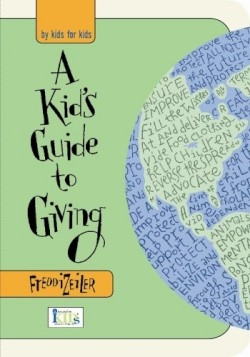 Though it took Zeiler seven years to write, rewrite, and then find a publisher for her guide to more than 100 kid-friendly charities, the end result is a resource for the whole family. As a teen, Zeiler realized that many other people did not have the comfortable, middle-class life that she enjoyed, and she felt inspired to do something about it. Creamy yellow-and-white pages offer boxes with tips such as cautioning kids not to go door-to-door without an adult, even in their own neighborhood. Zeiler also relates anecdotes, including the story of President Franklin D. Roosevelt’s campaign to raise money to defeat polio. That campaign is still going; it’s called The March of Dimes. Quotes from kids like nine-year-old Lucy, who gave $16 of her own money to UNICEF for the tsunami relief, are lightly scattered throughout. The first ninety-seven pages are written in a very friendly, conversational voice discussing charitable causes—what they are, how to choose one to contribute to, and three different ways of contributing. The first way is by giving money. Zeiler understands how hard it is for kids to give up part their money, so she suggests simple strategies like asking parents to withhold a set amount of allowance until a certain time, and then making the donation. Short chapters also cover contributing by giving things, and by giving time and effort. The list of charities is preceded by advice on finding other reputable organizations, doing thorough research before donating, and encouraging young people to find charities that reflect their personal values and passions. Though intended for children ages twelve and up, younger kids, with their parents’ help, can participate in almost every way presented. Each charity is given its own page, which includes a very brief description of their mission, how the organization uses the money, the breakdown of what percentage goes directly to the program or service, what percentage goes to administrative and fundraising, and how to get more information. By following her own desire to make the world a better place, the author has made it possible for many others to do the same. Anyone who reads even part of this important guide will be inspired to make a difference.